“The modern building must be true to itself, logically transparent and virginal of lies or trivialities.” – Walter Gropius on architecture in the early part of the 20th century. Looking out of the bus window it is easy to see Brisbane as a city that likes to grow modern buildings, but it is hard to imagine how many of the recent buildings here would be admired by the Bauhaus architects today. Certainly the majority of recent builds might be described as influenced by modernity, but these are not welcomed and embraced as organic, pure forms by those who live in the inner suburbs. They are seen rather as dark geometries that choke the vernacular wooden house and its surroundings. Whilst the design of the high-rises owe their form to the Bauhaus, they are hardly free of “virginal lies and trivialities.” Neither do they quote from the vernacular in the postmodern manner of Charles Jencks. Although post modernism appears in retrospect, to be a short, playful period in which semiotics influenced the ways that the past could be appropriated, into the design of quirky buildings. Postmodern approaches opened up possibilities for designers and architects to quote from the vernacular and play with the signifiers of modernity itself – as the Italian group Memphis did so well. Modernity in Brisbane is not actually to be signified by the adage form follows function but by arbitrary patterns formed by horizontal and vertical lines, stripes and details to create difference from the builds right next to it. Occasionally, the builds appear from under the cranes in their dark brown or charcoal grey overcoats. These recent builds pay scant attention to our climate or respect local idioms and wooden homes. What they set out to signify, is the quality and prestige of their soon-to-be finished 20 storeys, but it’s easy to believe the developers really want to build cheap, and sell dear. The Bauhaus is rendered irrelevant; postmodern just a dream. Marketing promotes every building as a high quality and/or a groovy development and there are always syrupy words on the perimeter fence of the site suggesting that this is the place to be. However, preferred readings suggest other ways of interpreting what is signified by the developers. For example: This is yet another high-rise that cares only for the company, not the people who will live in the shadow of buildings that should never have been approved. 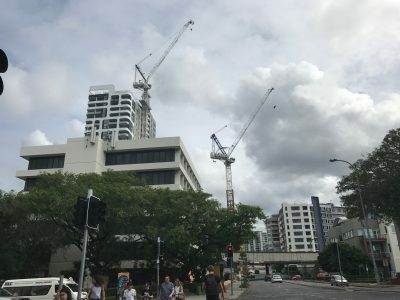 Importantly, there are many individuals and community groups who wish now to have a role – a say at least, in the ways in which development takes place in Brisbane. This is not so much about modernity and its successors, but rather the ways in which urban development works in relation to transport, open spaces, public walkways, parks, playgrounds, gardens, social amenities, affordable housing etc., and of course, central to this is the desire to see good design manifested in all urban projects. With these issues in mind, the inaugural Urban Design Awards initiated by Queensland’s Deputy Premier Jackie Trad are to be welcomed, as are collaborations and democratic participation in the design of buildings and precincts. Whilst we might not suddenly see great buildings coming out of the ground, we can hope that community groups will make a difference to urban design strategies in Brisbane. Maybe this is a sign of a renewed interest in a modernism where everybody recognises how valuable good design really is?